Hamilton School Board members recognized for service - Hamilton School District. 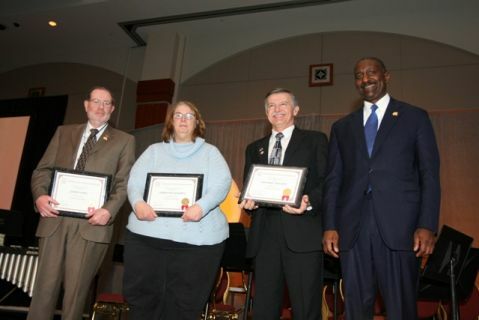 Michael Hyland, James Long and Dawn Van Aacken were honored at the 2011 State Education Convention for each serving 20 years on the Hamilton School Board. Wisconsin Association of School Boards (WASB) President Mary Janssen, a school board member for the Little Chute Area School District, thanked the three school leaders for their service. The WASB also recognizes the experience and knowledge the three members bring to their school board. In addition to work at the local level, Long is a regional WASB director. In this role, Long advocates on behalf of school board members across the state. Hamilton School Board President Gabe Kolesari is also a past president of the WASB. Van Aacken, Hyland and Long’s service provides an outstanding example of a fundamental tenet of Wisconsin’s system of public education – local schools that are governed by their own communities. The Wisconsin Association of School Boards is a nonprofit association that provides information and services to Wisconsin school boards in the areas of school law and policymaking, collective bargaining, legislation and leadership development.